Work with associated data, with “add new” functionality. Work with associated data, with “add new” functionality. Your web app will enable users to add new Track objects. We need an app that will display lists of Album, MediaType, and Track objects. The app will also enable the browser user to add new Track objects. Create a new web app, named Assignment5. It MUST use the “Web app project v1” project template. You will customize the appearance all of your web apps and assignments. Never submit an assignment that has the generic auto-generated text content. Make the time to customize the web app’s appearance. For this assignment, you can defer this customization work until later. Come back to it at any time, and complete it before you submit your work. Follow the guidance from Assignment 1 to customize the app’s appearance. We will be working with the track entity, AND some of its associated entities. Tip: Study the DesignModelClasses.cd class diagram that’s in the Models folder. It will help you visualize where the Track entity is located in the design model. Remember to add the [Key] data annotation to all/most of your view model classes. As noted above, the following use cases need view models, so go ahead and write them. We suggest that you need only “AlbumBase” and “MediaTypeBase”. If you also want to pull in Artist information, then you can create an “ArtistBase” class too (it’s easy to do). None of these “…Base” classes will have navigation properties, and none of these will have composed (AutoMapper flattened) properties. Keep them simple. The “TrackBase” view model class needs many of the track entity’s properties, but not all. As above, ignore the navigation properties in TrackBase. Also, you can ignore the MediaTypeId and GenreId properties. If you wish, you can create the class code blocks for them now, and we’ll fill in the details later (but soon). Define the maps that these use cases will need. At this point in time, you should have enough experience to know which maps are required. Ask if you need help. In the Manager class, add the methods that support the use cases. For “get all”, you should probably use a LINQ query expression to sort the results in a logical way. For “add new” track, you must use the coding pattern, which validates the incoming data by locating/fetching the objects that will be associated to the new track object. A new track has TWO associated objects – album AND media type. Therefore, you must fetch (validate) both, and configure them on the new track object before saving. Optionally, you can create controllers and views for the album, artist, and media type entities. They’re easy to do, and can help you visualize the data in those collections. Create a controller for the track entity. It will support the “get all” and “get one” use cases (and “add new”, described in the next section). Add views for “get all” and “get one” too. 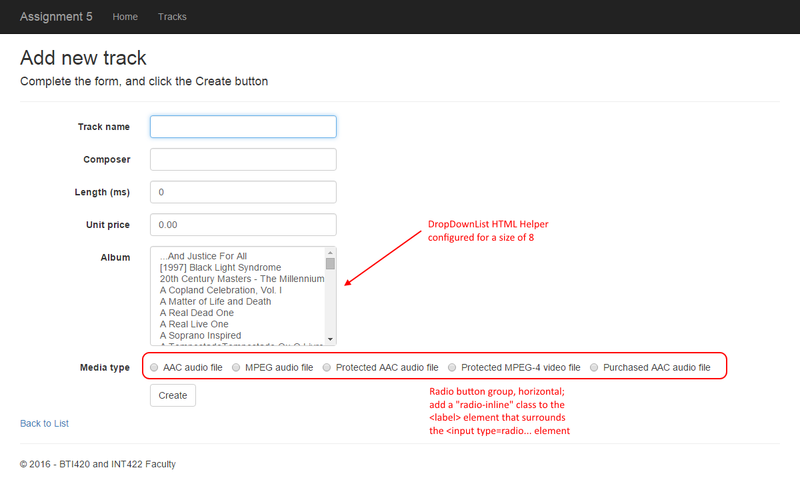 Its “TrackAddForm” view model class will need SelectList properties for both album and media type. Remember to follow the naming rule for SelectList properties. After you write the GET method (for “add new”), scaffold a view. It should look something like the following. Click the image to open it full-size in a new tab/window. Next, as you have learned, edit the view. Add item-selection elements for Album and MediaType. We suggest that you use a DropDownList HTML Helper for the Album. Make its size 8, so that it renders as a listbox. Use a radio button group for the MediaType. It would be nice to render it as a horizontal radio button group. Learn how to do this, by reading this section of the Bootstrap documentation. It should look something like the following. Click the image to open it full-size in a new tab/window. The “TrackAdd” view model class will be similar to TrackAddForm. However, replace the SelectList properties with int properties named <entity>Id. Make them “required” by adding [Range…] data annotations. Write the controller POST method next. After a successful “add new” result, redirect to the Details view.